Unless your pet is a very active outdoor dog his nails will need to be trimmed on a regular basis - anywhere from once a week to once a month. Nail trimming and grooming are activities that are often feared by both dogs and owners. The best way to calm your fears is to ask your Vet or a professional groomer to train you in the proper techniques for nail trimming. The best way to calm your dog's fears is to train it from a very young age to be comfortable with the process. 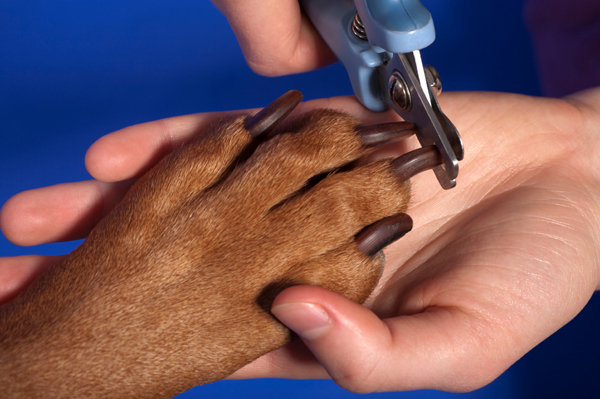 If you don't feel comfortable trimming your dog's nails your vet or groomer will be happy to do this regularly. And often dogs do not need their nails trimmed if they go for frequent walks on footpaths or concrete. Just watch those dew claws (thumbs). 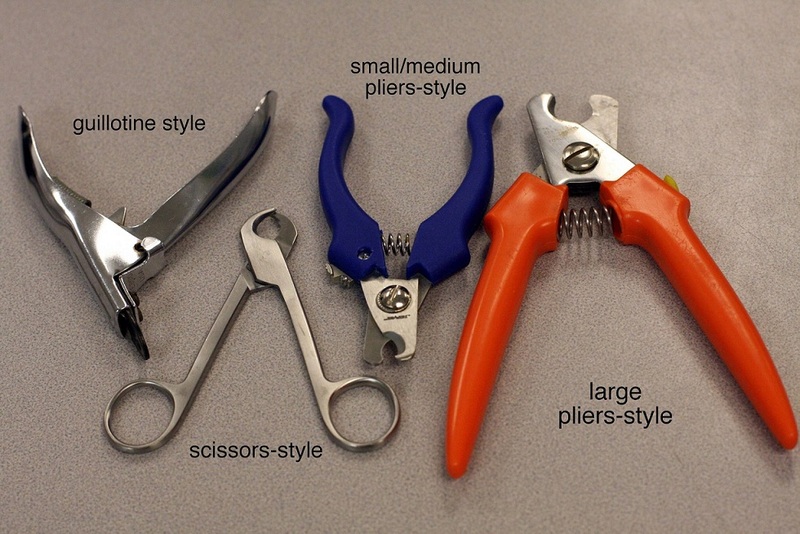 There are many different types of nail trimmers. Buy good quality trimmers that are sharp and designed for the correct size dog. They should be concave at the cutting edge, to avoid crushing the nail. Blunt or poor quality trimmers will split the nail. If the nails aren't that long but are sharp you can simply file them or use a pumice stone to take off the tips. In the US it is common to use a dremel to slowly burr down the nails and this can be more gradual and safer than clipping. The first step is to get some treats, make the whole experience positive and don't feel like you need to be a hero and trim all the nails at once. Start with one, reward and come back later if you or your pet is nervous. 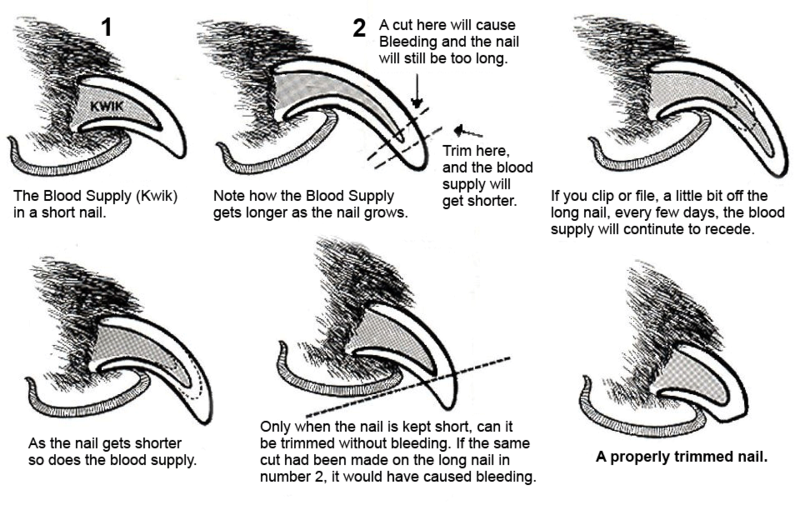 One technique that helps is to hold the handle of the nail trimmers flat against the toe pad and cut straight across the nail, so that the nail will sit just above the ground. This technique makes it extremely unlikely you will cut the nails too short. To get a shorter cut than the previous method, aim to cut at a 45 degrees angle, after visualising the quick. The quick is the pink area within the nail where the nerves and blood vessels are, similar to the area underneath our nails. If your dog has black nails, look at the underside of the nail and you will notice that towards the tip the nail separates out into a triangular shape with two outer "walls". At this point, there is no quick and it is safe to cut the tip off. Otherwise use the technique of simply cutting straight across from the pad, rather than attempting to cut up at a 45 degrees angle. Another trick of the trade is to apply gentle pressure with the nail trimmers without actually cutting where you think you need to cut. If your dog reacts to the pressure, most likely you are too close to the quick and you will need to more the clippers further down the nail. 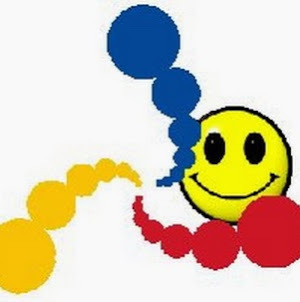 See video below by clicking the "play-button" (source: Click Me ). Download Video: Closed Format: "MP4" Open Format: "OGG"
WHAT IF I MAKE THE NAILS BLEED? If you accidentally cut the nails too short you can use styptic powder, or simply use a clean bar of soap and run it under the damaged nail. The soap will plug the vessel and stop the bleeding. Usually if you have made your dog bleed, they will be a bit nervous next time, so make sure you have lots of treats at the ready and take it slow. If you pet is nervous about nail trimming, view this video on how to counter condition your dog and get him used to nail trims (source: Click Me ). Older dogs tend to end up with long quicks, elongated nails and often extremely hard nails. Nails can also grow back a bit deformed if there has been some sort of trauma to the nail bed, such as when the dew claw has been caught in something and torn. Clipping after bathing can help with the hardness issue, as they nails will be softer. Ensuring you just take the tips off the nails or cut them so they sit just above the floor when your dog is standing can help to ensure you don't cut deformed nails too short. Alternatively, if you gradually take the tips off, you can often make the quick recede a little over time, but you will need to be patient. So long as your dog's nails are not touching the ground, getting caught in anything and causing the toes to splay out or bend, there is no need to worry too much about keeping them extremely short. Whenever you trim your dog's nails remember to make the whole experience rewarding by having treats at the ready and always take a little bit at a time if you can't clearly see the quick beneath the nail. And if you have a very patient dog, why not paint those nails!